As soon as you claim your product or service is “the best”… your prospects will want to see the explosion. They are instantly skeptical because everyone claims the same thing. All the competitors – I mean all of them – are saying some variation of “we are _______” (the fastest, best, most reliable). The way to prove your product – and kill the skepticism of prospects – is cold, hard facts. Important tip: In side-by-sides and tables, use a big “X” or check marks in every box under your product. Prospects should see blank space under the competing products. Aside from being hopelessly and uselessly vague, claims of being “better, stronger, faster” are simply disbelieved. Instead, back up the claims with facts. 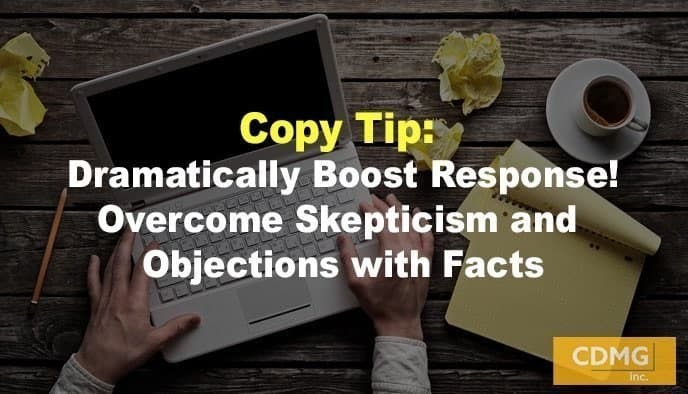 If you’d like to talk about how you can create powerful, response-boosting copy that overcomes skepticism, give me a call. Call (310) 212-5727 or email Caleb at caleb@cdmginc.com. Testing Corner: What kind of Facebook ad will get you the lowest cost-per-lead?